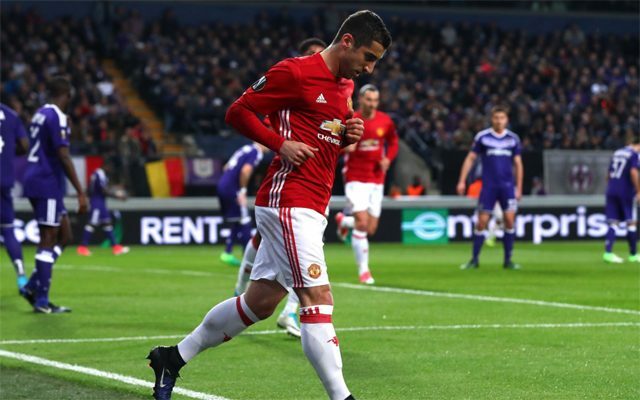 Manchester United were held to a 1-1 draw by Anderlecht in the first-leg of their Europa League quarter-final. The Europa League provides the most realistic avenue into the Champions League next term for Jose Mourinho’s side, and the competition’s importance was reflected in the starting eleven ‘The Special One’ fielded this evening. Paul Pogba, Zlatan Ibrahimovic and Henrikh Mkhitaryan all started – and it was the Armenian to bagged the opening goal. Mkhitaryan was the quickest to react to the loose ball in the Anderlecht penalty area. He fired home from close range to score what could prove to be a crucial away goal for Man United. You can see his goal here. However, Anderlecht would an equaliser late on. Leander Dendoncker beat Sergio Romero with a bullet header to ensure it would end 1-1 on the night. It’s very much all to play for in the tie now. Click here to see Dendoncker’s first ever European goal. That proved to be enough to rescue a draw for the Belgian giants, but Man United carry a narrow advantage to Old Trafford after bagging an away goal. Here are our player ratings for both sides.